Mustard is a widely used spice, with known anti-cancer properties and high selenium and magnesium content. In Indian cooking, whole mustard seeds are used as a flavor base for a range of vegetable curries, by heating in a little oil until the seeds make a popping sound, and then adding the vegetable ingredients. 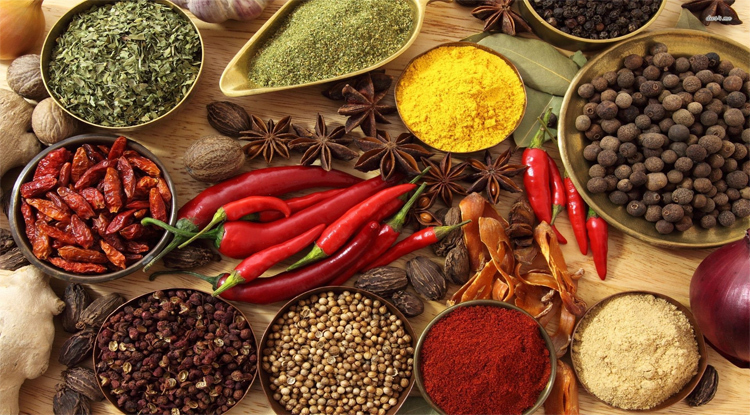 Chilli Powder has become basic ingredient in Indian culinary. Chilli powder adds flavor to the food. Chilli powder has many beneficial properties, making it an important part in Ayurvedic medicines to fight many diseases, destroys harmful toxins and stimulate gastric juices that help in digesting food. It also helps in clearing nasal congestion, relieves throat infection, and acts as Painkiller in muscle spasms. It also increases thermo genesis (heat Production) and oxygen consumption which contributes to weight loss. Cardamom is called "the Queen of all spices" and contains the antioxidant cineole. Cardamom is another spice regarded as a cure-all. Cardamom detoxifies the liver, strengthens the immune system and calms the nerves. Cardamom is used to fight kidney and stomach cancer, and also to treat digestive problems, asthma, and urinary tract infections. Cardamom seeds freshen the breath..
Turmeric is also known as curcumin contains curcuma, the pigment providing the bright yellow/orange color and antioxidant. A natural pain killer, turmeric detoxifies the liver, treats arthritis, reduces nervous tension and fights depression. Also used for psoriasis, turmeric boosts metabolic function and reduces body fat. Turmeric is used to treat leukemia, multiple sclerosis, melanoma and Alzheimer's disease. When turmeric is combined with cauliflower it is believed to help prevent cancers of the pancreas, prostate, liver and lungs. Turmeric has antiseptic, antibacterial and anti-inflammatory Properties. Pepper is an extensively used spice both in Eastern and Western food. It has an impressive antioxidant and antibacterial effect and helps with digestion and weight loss because it stimulates the breakdown of fat cells. Cumin is excellent for colds and fevers when infused in hot water, also purifies the blood and protects against stomach infections. It is a good source of iron, and has traditionally been used to aid digestion. Cloves have an intense aromatic flavor and contain an active component called eugenol which has mild anesthetic anti-inflammatory and anti-bacterial properties. Commonly used as a topical pain reliever for toothaches. Also used as a sore throat spray, to treat joint pain, and to reduce skin inflammation, clove even helps fight stomach cancer. Fenugreek has a powerful pungent, bittersweet flavor that is released when the small hard seeds are roasted. Fenugreeks delay gastric emptying & stimulates insulin secretion & hence are beneficial in diabetics. It is also a rich source of omega-3 fatty acids. Tamarind (Hindi name: Imli) has a refreshing sweet, sour taste with a slight fruity aroma. The tamarind bean contains a sticky pulp which is used as flavoring for its typical aroma and taste. Tamarind is antiseptic, mild laxative and digestive. Gargles with Tamarind water are recommended for a sore throat. Being highly acidic, it gives a cooling effect on out body in summer. It is believed to boost metabolism. Cinnamon can be used ground or whole, to flavor beverages, curries, rice dishes and desserts. The essential oils found cinnamon give it anti-clotting and anti-microbial properties and recent studies have shown that it slows the rate at which the stomach empties after meals, reducing the rise in blood sugar after eating. Ginger is one of the healthiest spices available. It has long been used as a herbal medicine to relieve gastrointestinal distress and nausea, and in modern times has been shown to have anti-inflammatory and antioxidant effects. It is also used as a natural remedy for cold and flu symptoms and is thought to have immune boosting action. Garlic is a powerfully flavored spice that improves the flavor of any dish, and has been used for centuries for its therapeutic benefits . It is also counted amongst the list of most healthy spices. Garlic contains a number of sulfur compounds and also vitamin C, vitamin B6, selenium and manganese. Studies have shown that garlic helps prevent atherosclerosis, heart disease and potentially cancer as well. One of the most potent compounds in garlic is allicin, which has been shown to not only lower blood pressure, insulin and triglycerides, but also to prevent weight gain.